(HOST) As President Obama marshals support for his economic programs, commentator Vic Henningsen wonders if he can learn anything from the way Franklin Roosevelt approached a similar problem. (HENNINGSEN) Bad as things are getting these days, it’s still true that they pale in comparison to March 1933: unemployment neared 30%; all banks in the country were closed. 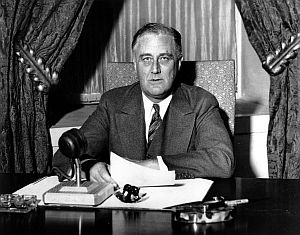 When President Franklin Roosevelt addressed the country on March 12th, in the first of what came to be called "Fireside Chats", Americans had been operating for almost a week on barter and handwritten IOU’s. When Roosevelt spoke the entire nation listened. (FDR) My friends: I want to talk for a few minutes with the people of the United States about banking. Radio was relatively new and politicians, in particular, didn’t use it effectively. Most talked over the heads of their audience or talked down to it. Roosevelt knew he had to connect with the American people, clearly and simply. (FDR) I want to tell you what has been done in the last few days, and why it was done, and what the next steps are going to be. Carefully he explained measures to reform and re-open the nation’s banks. His manner was low-key – folksy. It’s said he imagined talking with individual Americans across their kitchen tables, keeping the faces of farmers, grocery clerks, and housewives in mind as he spoke. And he succeeded. FDR was so clear, said humorist Will Rogers, even the bankers understood him. (FDR) Confidence and courage are the essentials of success in carrying out our plan. You people must have faith; you must not be stampeded by rumors or guesses. Let us unite in banishing fear. We have provided the machinery to restore our financial system, and it is up to you to support and make it work. It is your problem, my friends, your problem no less than it is mine. Together we cannot fail. During his first hundred days Roosevelt spoke to the nation twice, in Fireside Chats less than seven minutes long. The fewer the talks, the easier to command national attention and mold public opinion. Today, President Obama must compete for the attention of a multi-tasking public bombarded by 24-hour news cycles that are very good at feeding rumors and guesses. In Roosevelt’s day a presidential address to the nation was rare; today it’s routine. Where Roosevelt could employ a rifle-shot strategy to shape public opinion, Obama must use a shotgun. He must employ every available means to get his message out: holding press conferences, stumping the nation – in person and on YouTube – , speaking to Congress, and convening summits. Like Roosevelt, Obama is employing controversial methods to confront a massive economic crisis and, like Roosevelt, he must persuade the public to back him. Roosevelt had the bigger crisis. But Obama has the bigger challenge.